I’ve been a fan for years of using organic essential oils for just about everything. I use them to clean, for health, to relax at night, in the bath and even on my animals. I have a huge collection of essential oils from different brands, for different purposes and for different occasions. I’m not biased to any one brand at the moment and enjoy trying new ones. I do recommend Young Living and using only high quality, organic essential oils. It’s not about quantity, but quality- make sure you are buying pure oils that are not over processed or filled with fillers. Sometimes I feel like a witch or a chemists making combinations for my husband, myself & our animals. It’s actually becoming more and more a side passion. Through my pregnancy certain scents have helped me with nausea in the first trimester, like lavender, grapefruit and eucalyptus. Now in my third trimester I’m loving clove, cinnamon, rose and always lavender. I’m finding these essential oils are heartwarming and very grounding, but invigorating to keep my energy up even though I’m beginning to “nest” and slow down. I’m so fortunate to have in my life amazing and deeply passionate, educated women. 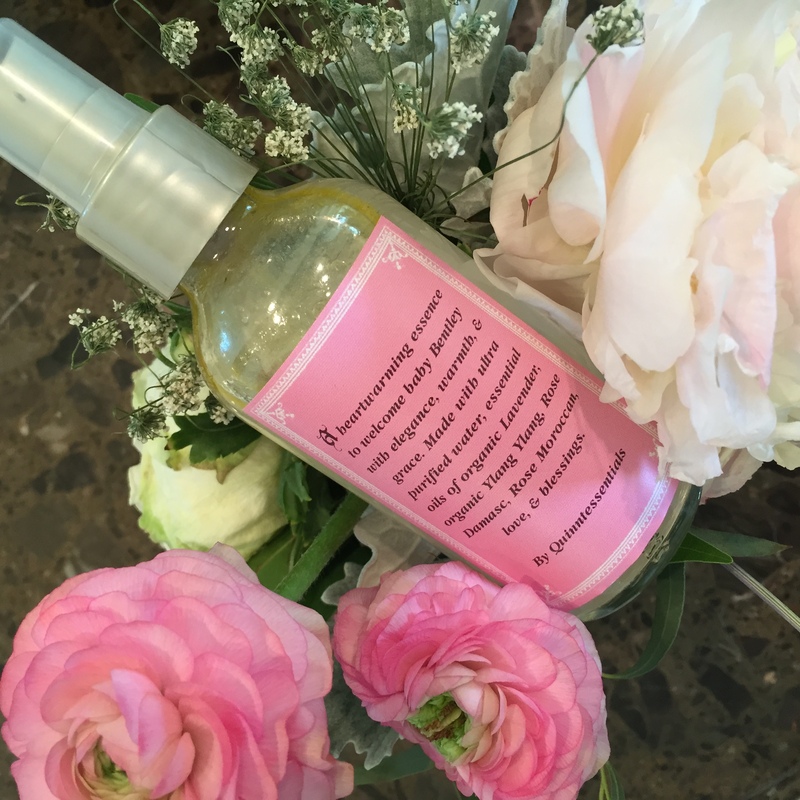 One of my dear and closest friends for my baby shower worked with a local San Diego based & certified Herbalist and Aromatherapist, Julie Quinn of Quinntessentials organic essential oil products to create a customized spray for my baby Girl. Talk about an incredible gift! The best part is she made several so I could not only keep some, but also give them as gifts at the shower. I gave my friends who helped plan the shower it as a thank you gift as well as the Grandma’s and Aunts. Everyone was blown away at how unique, special and personalized it was. 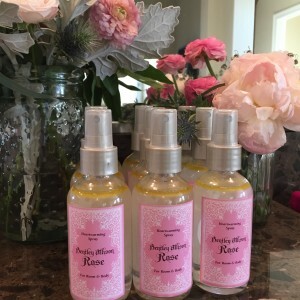 I highly recommend working with Julie and her company on a scent for your new baby or just for yourself during pregnancy and child birth. I know I’m planning on using my daughter spray during our labor and then after with her as a newborn.